Ancient Egyptian cats had a sacred status in because of the religious beliefs of Egyptian society. Middle Eastern species of cats were domesticated in Egypt about 10,000 years ago and while various other animals were also considered sacred, cats had a special status among those animals. Cats were considered a symbol of grace and were useful for their helpful services such as the killing of snakes and controlling vermin. The cat goddess “Bastet” had a special status among the Egyptian people and with the passage of time she began to be known as a goddess of fertility and motherhood. The History of ancient Egyptian cats can be traced back well into pre-historic times. According to the DNA tests that have been carried out in the modern times, it is made clear that the cats belonged to a Wildcat subspecies of the Middle East and were domesticated around 10,000 BC. Cats had attained sacred status even before the formation of the Egyptian Kingdom and after that the status was institutionalised. Ancient Egyptian cats enjoyed a sacred status in the religion of this country and cat deities existed even before the formation of the Kingdom itself in 3100 BC. The goddess Bastet was the cat goddess which was originally a warlikeCat lioness but eventually became associated with domesticated cats. Cats were worshipped by the Egyptian people for various reasons. They were popular because they kept away vermin, killed snakes and caused various other blessings for the people. 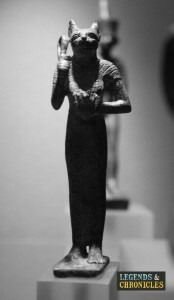 A statue of Bastet showing the appreciation given to cats in ancient Egypt. Broadly speaking, ancient Egyptian cats can be classified into two main types. These two types are jungle cat and African wild cat. Cats of both these types began to be domesticated during the Pre-dynastic Period. They earned their status due to various reasons such as the killing of mice and various pests in addition to killing snakes. All these creatures threatened the grain stock of the Egyptian people and thus cats saved the people from hunger and starvation. 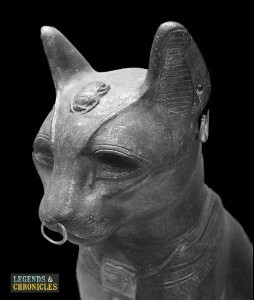 Rich symbolism was associated with ancient Egyptian cats. Cats symbolically represented the guardian of the underworld. Due to their divine relevance, there was not only a cat goddess, but cats were also honoured upon death through mummification. The cult of the cat existed during the New Kingdom and a centre of worship was built for the cat goddess, Bastet. Thousands of pilgrims came to the temple every year. With the passage of time, Bastet evolved into a more powerful deity which represented fertility and protection and was called Eye of Ra. The status of animals, other than cats, was important in ancient Egyptian religion. Animal worship had existed since the prehistoric times and gods were usually embodied in the form of animals that represented their specific abilities. So, for instance, the god Thoth was associated with the Baboon, and Taurt had the head of a hippopotamus and the claws of a lion. Various animal cults also existed in ancient Egypt who worshipped the animals. During the later kingdoms, even temples for animals were erected where specific animals were raised. Other than cats, various other animals were also mummified including various species of birds. The mummified animal was then placed in a cemetery near the temple. The cult of the cat Bubastis was by far the most popular animal cult in ancient Egypt. This cult was devoted to ancient Egyptian cats and the cat goddess Bastet. Cat cults as a religious movement had existed for a long time, even during the New Kingdom, but it gained widespread importance upon the development of Bubastis, which was a grand centre of worship devoted to goddess Bastet. People belonging to this cult travelled long distances every year for a pilgrimage to the Bubastis. Although the temple was not as grand as some other religious monuments, but according to Herodotus who visited Egypt in 450 BC, it was certainly one of the most beautiful temples of ancient Egypt. The temple was surrounded by a canal which gave it the look of an island. A grove of trees in the graveyard led the way to the interior which contained a large statue of Bastet. Many cats were housed in the temple and enjoyed a sacred status. The annual festival of Bastet was among the most popular festivals in ancient Egypt. It was a common tradition to mummify the cats when they died in this empire. Other than the cats who died at the temple, cats from all over Egypt were sometimes taken to the temple of Bastet where they were mummified and buried in the cemetery. Linen sheets were used to wrap the dead cat and a procession was taken out for it. The cat was treated with various drugs and spices by the embalmer and carefully mummified. Interestingly, while the cats of the rich people enjoyed special status, cats of the common people were also carefully mummified. The tomb discovered at the temple of Bastet in 1888 had over nineteen tons of animal mummies and remains. Most of these animals were cats, although there were other animals as well, such as dogs and foxes. 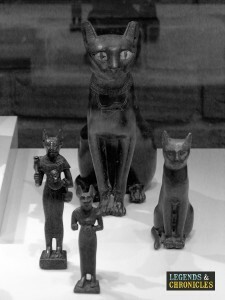 A selection of cat sculptures and mini figurines of Bastet. Ancient Egyptian cats enjoyed a sacred status because of their utility as domesticated animals against various pests, mice, and snakes. The cat goddess Bastet was quite popular and the temple of Bastet was erected in her honour which housed thousands of cats. The cats were mummified after death and were buried in the cemetery of the temple. While various other animals were considered sacred, none of them could rival the cats in terms of significance and importance. The cult of the cat was very popular in ancient Egypt and their yearly festival was celebrated at the temple of Bastet. The temple was considered one of the most beautiful temples in ancient Egypt. However, cat worship declined during the later period of ancient Egypt until the cult of Bastet was officially banned in 390 AD.